The Simple Download Monitor Plugin comes with a built in feature that enables you to clone any downloads that you have previously created. This feature is useful if you wish to create a number of downloads that are similar to one another with just one or two slight changes. The Clone/Copy feature of the Simple Download Monitor Plugin enables site admin to quickly and easily duplicate any of their downloadable items. This feature is vital for sites that constantly offer similar downloads with slight variations to each. Clicking one button (Clone) allows admin to have a duplicate copy download that they can then go ahead and make a slight modification to. This feature saves admin time and in turn money. 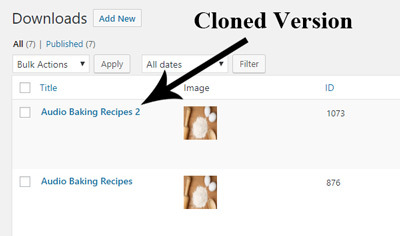 The clone feature is represented as a button on each of the downloads in your WordPress dashboard. All the downloads that you have created will be listed one after another. Hover over the download that you wish to copy. Under the heading of the download in question, you will see a button titled ‘Clone‘. Clicking the Clone button will create a duplicate of your download. You will be taken to the Edit Download page of your copied download. You can now make modifications to the cloned version. Once you have finished editing the download, click the Publish button. After you have cloned and published the item, it will appear under the Downloads menu. In the example below, the Audio Baking Recipe was cloned. The new version was then titled Audio Baking Recipe 2.